Dr. Jijun Yuan, CEO of Shanghai Genbase Biotechnology, presents "High Affinity Anti-CLDN18.2 Antibody for the Treatment of Gastric/Pancreatic Cancer" at the AACR Annual Meeting 2019 in Atlanta, Georgia. 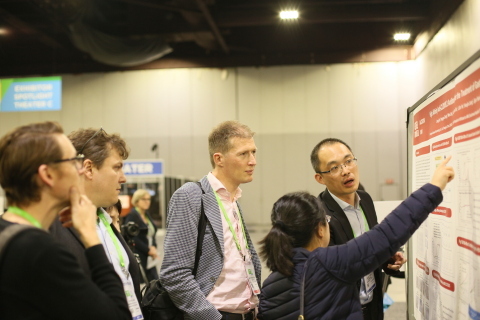 ATLANTA--(BUSINESS WIRE)--Aiming to help accelerate progress in the global battle against cancer, Shanghai Genbase Biotechnology Co. Ltd. (Genbase) was one of Shanghai's 89 top biotechnology innovators showcasing their leading-edge research at the American Association for Cancer Research (AACR) Annual Meeting 2019 in Atlanta, Georgia last week. Of the accepted poster presentations, 40 were on promising targets for tumor immunotherapy — antibodies targeting CD47, PDL-1, and CLDN18.2. Genbase’s work, along with other Shanghai-based biotech companies, reflect the metropolis' rise as a hub for oncology research and solutions to address underlying causes of cancer growth and spread. 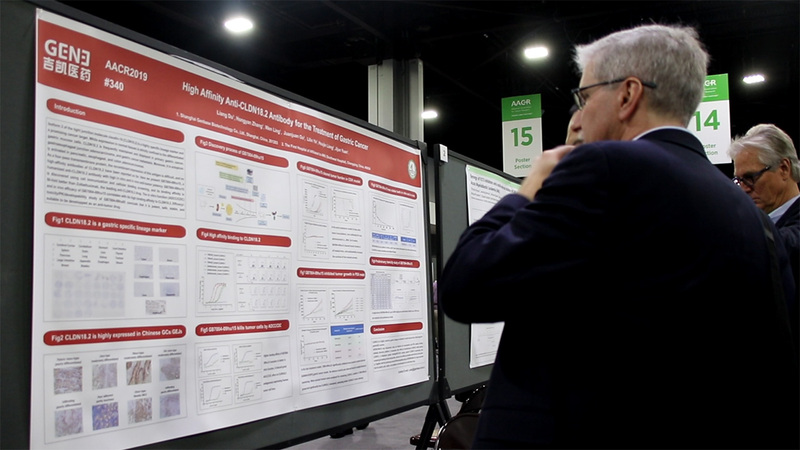 This prestigious annual AACR event covers the latest discoveries in cancer research and highlights the work of the best minds from institutions and hospitals around the world. This year’s meeting, which took place March 29 to April 3, drew more than 20,000 attendees from 60 countries. Of the 386 poster presentations from China, close to a quarter hail from Shanghai. A wholly-owned subsidiary of Shanghai Genechem, and a company at the forefront of gene research, Genbase epitomizes Shanghai’s top biotechnology firms. At the conference, Genbase scientists presented two posters describing their efforts to revolutionize pre-clinical development of cancer treatments. Featured work showed data from novel models that enable precise evaluation of new cancer therapeutics, including T-cell therapies and targeted cancer immunotherapies. Researchers developed a new antibody which had a much higher affinity (30—50 times) and tumor killing activity than the currently clinical leading antibody Zolbertuximab. With gastric and pancreatic cancer some of the most difficult types of cancer to treat, the new antibody may provide a breakthrough solution since it is more stable in clinical practice, more affinitive and more suitable for the treatment of these two cancers. Here scientists focused on CAR-T and TCR-T cell therapies. Cell-based immunotherapies have proven to be one of the most groundbreaking developments in oncology. But making CAR-T work in the more common solid tumors — breast, lung, colon, and the like — requires a lot more work because of the tumors’ immunosuppressive microenvironment and tumor heterogeneity. Scientists discovered a natural antibody, 7AI, that can effectively target HLA & peptide complex of solid tumors, making it possible to target soluble targets by CAR-T in solid tumors. Founded in 2002, Shanghai Genechem is China’s leading company in gene technology services, research and development with more than 500 scientists. In the past 17 years, Genechem has closely worked with 7,000 clinical scientists on 11 cancer research fields in more than 400 tertiary hospitals across the country. Genbase, one of Genechem’s subsidiaries, is an innovative immunotherapy company focusing on developing cutting-edge gene, antibody and cellular therapies to address tremendous unmet medical needs in China and globally.